Organized crime funded by illegal trade in natural resources is fueling the 20-year-long conflict in the eastern Democratic Republic of the Congo, DRC, that has cost the lives of several million people, the United Nations Environment Programme reports. The DRC government, supported by the UN Organization Stabilization Mission in the country, MONUSCO, is confronting both a political insurgency and large-scale smuggling and laundering of natural resources conducted by militarized criminal groups with transnational links. Released today, the report shows an increased awareness of, and response to, the growing involvement of organized crime and calls for concerted action to stop both the smuggling and the armed groups it supports. Gold, minerals, timber, charcoal and wildlife products such as ivory, valued at up to US$1.3 billion annually, are exploited and smuggled out of the conflict zone and surrounding areas in eastern DRC, finds the report. There is evidence that these revenues finance at least 25 armed groups that destabilize the peace and security of eastern DRC. Jointly produced by UNEP, MONUSCO and the Office of the Special Envoy for Great Lakes Region, OSESG, the report relies on the input of experts from: the UN Office for Drugs and Crime, Interpol, the UN Group of Experts on the DRC, DRC government agencies and nongovernmental organizations. The experts estimate that 10-30 percent of this illegal trade – between US$72 and US$426 million a year – goes to transnational organized criminal networks based outside eastern DRC. Around 98 percent of the net profit from illegal natural resource exploitation – particularly gold, charcoal and timber – goes to transnational organized criminal networks both inside and outside DRC. By contrast, armed groups based in the DRC retain just two percent of the net profits from smuggling – about US$13.2 million a year. This income subsidizes at least 8,000 armed fighters a year and enables defeated or disarmed groups to continuously resurface and destabilize the region. The region holds some of the world’s richest natural resources and vulnerable wildlife. 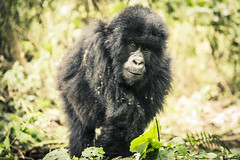 This includes the critically endangered mountain gorillas, targeted by criminal groups as retaliation for park rangers interfering with the illegal charcoal trade inside the Virunga National Park. The report warns that transnational organized criminal networks “divide and rule” armed groups in eastern DRC to prevent any single armed group from achieving a dominant role. 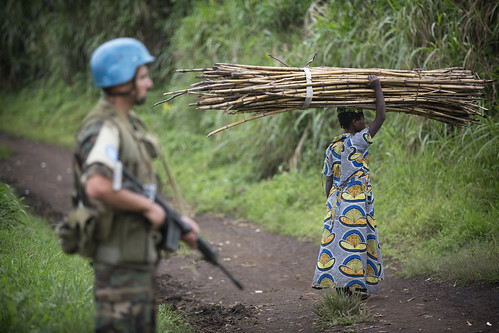 The experts recommend that MONUSCO undercut the lifelines of armed groups with links to transnational criminal networks by strengthening its information sharing and analysis capacity and strengthening the capacity of the Congolese national police and the justice system to investigate and prosecute environmental crime. MONUSCO should also strengthen its existing cooperation with the Congolese Wildlife Authority, ICCN, to safeguard protected areas and World Heritage Sites from illegal natural resources exploitation and their use as ‘safe havens’ by armed groups. Finally, the experts recommend that MONUSCO continue advocating for legal and fiscal reforms to formalize the legal exploitation of natural resources, particularly of artisanal gold mining, logging and charcoal production, in coordination with bilateral and multilateral development partners.